So, with all my free time, I finally sat down and filled in all the predictions and results from this season of Hands Free Football. Here are the results. While Dave once hit 100% accuracy (not included on this graph because it wasn’t on an episode of HFF, it was pre-game at Century Link with both Tyson and Carol as witnesses) he achieved 0% accuracy during 6 of the 28 episodes he gave predictions in. 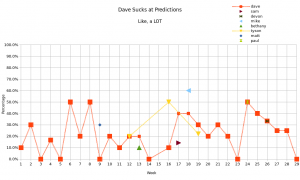 Of the 282 outcomes that Dave predicted, he got 61 of them correct, for an overall accuracy rating of 21.6%. Mike remains our most accurate guest with a 60% accuracy rating, which I think he managed partly by predicting outcomes but not score lines, which seems to have worked out well. Congrats, Mike! You win…something. We’ll figure it out. If you’re wondering, if Dave had used Mike’s strategy and only predicted outcomes instead of scores, he would have gotten 50 out of 141, or 35% accurate, which is better, but still has him weeping into his scarf.